When YouTube Beauty experts began touting a new drugstore foundation that provided water-resistant full coverage for less than $10, I was super excited. I went to multiple drug stores across our area. I ultimately located a single bottle in a CVS store over an hour from our home (thank you online product locator!). I waited to try the product until I found another bottle in a second shade. Another family member heard about my searching and found a couple of stray bottles in her town so I ended up with 3 bottles of this tough-to-come-by product. But alas, after all that effort and all the hype, I was pretty disappointed because it just didn’t look very good on me. The coverage was there but it seemed to emphasize every tiny bit of texture on my face. Worst of all, it settled in the crows feet around my eyes. That’s an unpardonable foundation sin in my eyes (no pun intended). So I set all 3 bottles aside, writing the whole experience off as yet another makeup disappointment in along the way in the endless search for my holy grail foundation. A few days later I noticed those bottles and got to thinking about all the effort that went into obtaining them so I decided to play with it a little to see if I could make it work for me. I really wanted to like it because inexpensive foundations with this level of coverage do not come along every day. When I was younger, not that much younger, but before I got married and before I had our daughter playing with makeup was fun. Now it’s more of a chore because I don’t have a lot of time to do it, but I happened to have a few minutes on this day to play. So I took my time and prepped my skin with a good moisturizer and sunscreen. I allowed it sink in and then blotted my face before applying a primer which I allowed to set for a god 5 minutes. Then I used a damped beauty blender® and applied 2 pumps of this foundation along with another couple of products (explained in a separate post) and set it with a powder. You know what? It’s a really beautiful foundation! I discovered that even those of us with dry or mature skin can wear this foundation and have a lovely result. I have come to the conclusion that most people can’t just slap this foundation on and expect it to be pretty. It’s tricky for both dry and oily skins alike. But with proper prep it’s lovely; has a beautiful full-coverage finish and long wear-time. It may not be realistic for you to go through the prep to wear this everyday. 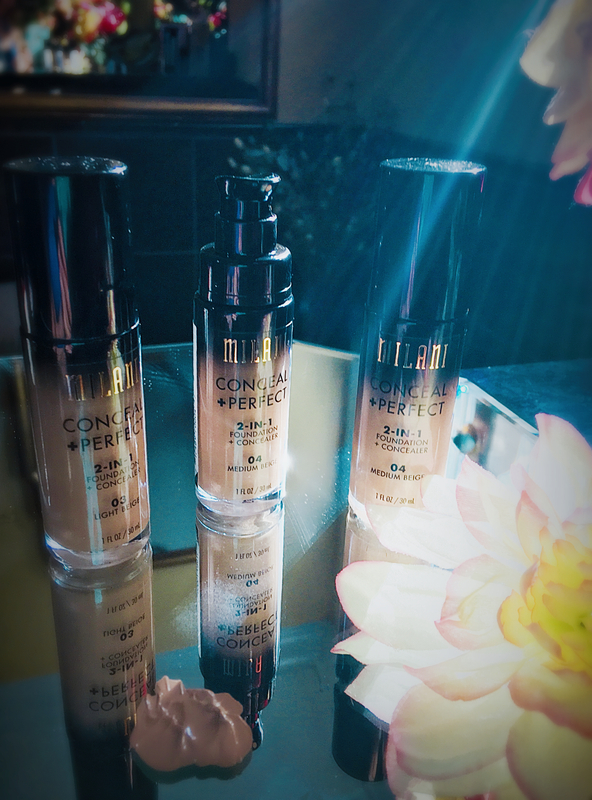 But at this price point, Milani’s Conceal+Perfect 2-in-1 Foundation+Concealer deserves strong consideration for a spot in your beauty top drawer lineup. Color Range: Milani created 14 shades this foundation in 14 shades most of which are neutral, with varying levels of yellow or red undertones. It’s worth noting that several reviewers have complained that the lightest shade, 01 (Creamy Vanilla), is too dark and/or too yellow for very pale complexions. I can successfully wear shade 03 (Light Beige) or 04 (Medium Beige) and noticed that several of the shades are workable for light-medium skin tones. I’ve also noticed that most drugstores only carry a few shades; that none of the Walmarts in our area carried this foundation; and that none of the stores carried any of the darker shades which was really disappointing. This product has a lot in common with Urban Decay’s recently launched “All Nighter” Foundation (similar texture, coverage and longevity promises). But while Milani offers fewer shade options, those shades don’t tend to darken, change colors on the dry-down or noticeably oxidize which are common complaints among reviewers at Makeup Alley of All Nighter. Coverage: This is FULL coverage friends! Full. Coverage. Lots of foundations promise full coverage, but this one delivers. 2 Pumps was fully sufficient to cover my whole face with a damp sponge. I had enough left over to cover some sun spots on my chest and touch up some red areas around my nose that always need extra coverage. 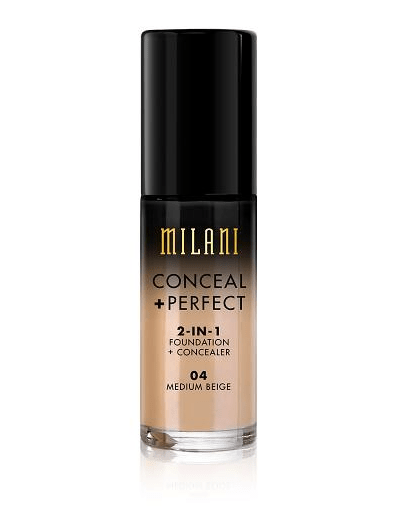 Re Milani’s claim that this doubles as a concealer – yes and no. As I mentioned above, additional layers or spot application quickly and easily covered and sun spots or minor discoloration but it is not sufficient to cover the puffiness and dark circles under my eyes. For that, I need to mix the foundation with high-powered concealer. Texture + Finish: The texture of this one could be described as a liquid/cream hybrid. The finish is more satin than matte with a hint of luminosity that is flattering at first, especially on dryer skin. However, it can emphasize any uneven texture or flaws on the skin and may not flatter oilier skin types. Wear: Milani claims this foundation is waterproof and wears all day, and “works around the clock to keep skin looking naturally perfect.” This will wear at least 6 hours with a silicone-based primer. And because the finish is more satin than matte, I’d recommend setting it with powder, even for drier skins and especially for those with combo to oily skins. Oily skins will get the longest wear by using a mattifying primer underneath. Dry skins should be careful not to use an oil-based moisturizer or sunscreen product before applying this foundation. Because this is an oil-free foundation it won’t react well to oil-based products and that oil will in fact cause the foundation to break apart, shortening the its longevity. 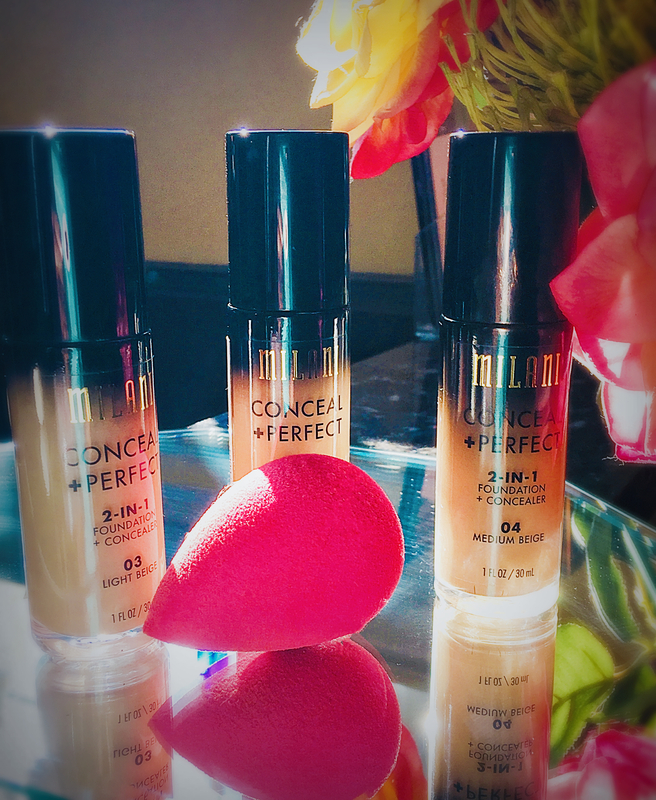 Application: Milani recommends the following application, “Apply a dime-sized amount of product with fingertips or a brush beginning at the center of the face, blending outward.” I prefer applying this with a damp beautyblender® type sponge. I had some success using my finger as well, but I just really dislike apply foundation with fingers. For some reason I dislike the feeling of it on my fingers and hands. Has nothing to do with the texture of this particular product. Actually, if you enjoy using your fingers to apply foundation, this may be a good match for you because the warm of your fingers may help you spread this around. Because it’s thicker than your typical liquid foundation (MUF’s Ultra HD Foundation for example), I found that applying it with a brush left streaks and just wasn’t very pretty. I wouldn’t try it unless you’re lucky enough to own an Artis (oval 7) foundation brush. To avoid creasing, I’d recommend setting this with powder, even for drier skins but especially for those with combo to oily skins. Skin Beneficial Ingredients: This foundation is composed primarily of water and a mix of multiple silicones (all the silicones highlighted below) as well as various oil-free emollients including glycerins and wax. This also contains a very small amount of a fruit-based (in this case plum) extract – Prunus Domestica Fruit Extract – shown to provide some antioxidant properties. But it’s way down the ingredient list and not a powerful or well-researched antioxidant so I would count on it to do very much for your skin. Full Ingredient List: Water, Cyclopentasiloxane, Isononyl Isononanoate (oil-free emollient), Cetyl Dimethicone, Butylene Glycol, Mica (shine), Glycerin (oil-free emollient), BIS-PEG/PPG Dimethicone, VP/Eicosene Copolymer, Bis-Vinyl Dimethicone, Ozokerite (wax), Polymethylsilsesquioxane, Disteardimonium Hectorite, Sodium Chloride, Phenoxyethanol, Beeswax (wax), Glycereth-18 Ethylhexanoate (oil-free emollient), Potassium Sorbate, Silica, Caprylyl Glycol, 1,2-Hexanediol, Xanthan Gum, Isododecane, Propylene Carbonate, Prunus Domestica Fruit Extract, Glycereth-18, Aluminum Dimyristate, Triethoxycaprylylsilane, Disodium Stearoyl Glutamate, Allantoin, C30-45 Alkyl Cetearyl Dimethicone Crosspolymer, Polyisobutene, C18-21 Alkane. +/- May Contain: Titanium Dioxide (CI 77891), Iron Oxides (CI 77491, CI 77492, CI 77499). 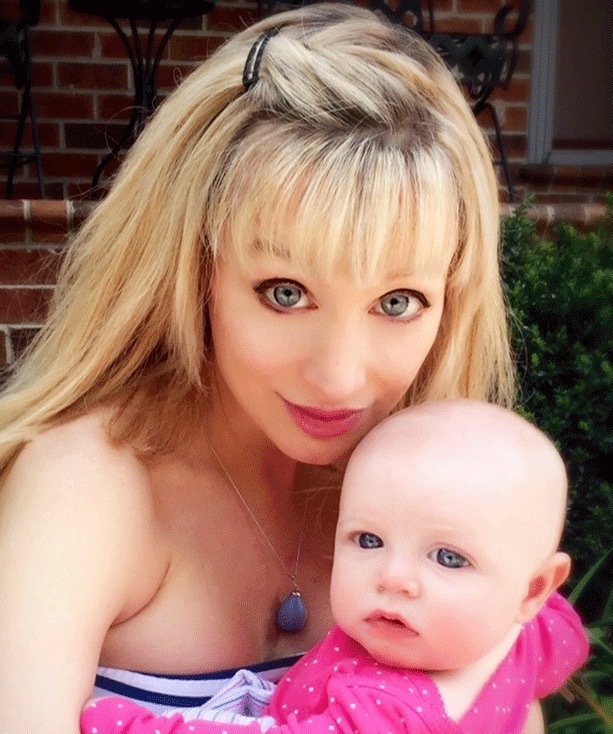 Summary and Daily Beauty Wisdom Rating: There’s much to love about this product. But if you read the reviews, you’ll notice lots of people have trouble with it too. It’s definitely tricky. Oily skinned gals find it breaks up and gets shiny; while those with drier skin find it emphasizes rough patches and fine lines. When I first tried this foundation, I was really disappointed and was convinced it just didn’t work for me. It takes a couple of tries and sufficient prep to get it to work for you. If you have the time and patience, it can be a beautiful, cost-efficient foundation for days when you want to “go all out.” I’m loving this one now. After some trial and error, this has become my current fav. It’s even replaced Revlon’s ColorStay Whipped Creme Makeup as my go-to foundation for a flawless, full coverage look. Be on the look-out for a follow-up post sharing the tricks I discovered to make this work for me! Find full product detail and info at Milani’s product page here. 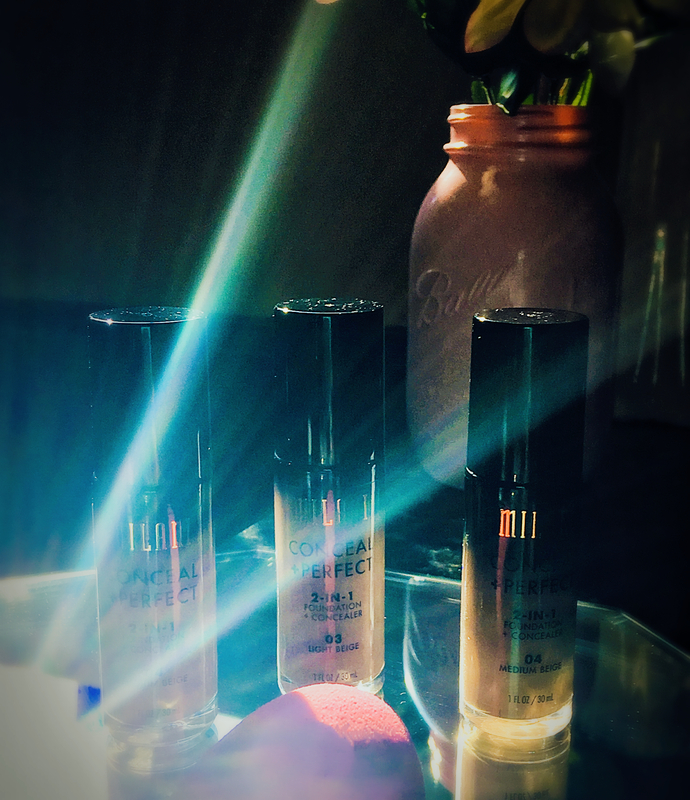 This entry was posted in Beauty Bargains, Beauty Product Reviews, Concealers, Foundations and tagged #bblogger, #bbloggers, #beauty, #beautybargains, #beautyblogger, #drugstorebeauty, #foundation, #makeup, #makeupreviews, #milani, #ROTD.